Bring elegant curves and unique style to a corner of your house with this Good Directions Small Single Link Rain Chain. This decorative, copper chain easily replaces a downspout on your home, lending striking detail and color to it while providing a necessary function. 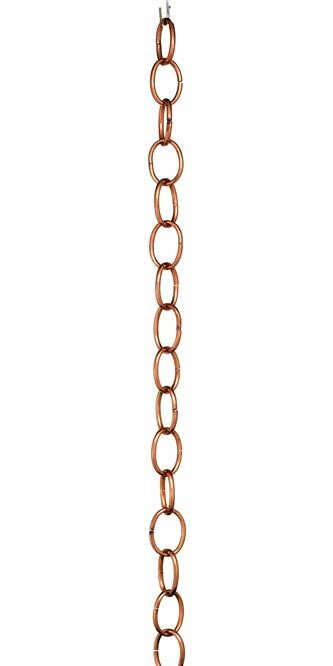 Several 2.5" long, interlocking links form this classic chain, and each sports a polished finish for a bold garden accent. The oval links attach together via small openings on each, and this design also allows you to remove a link to customize the length of the unit. Place the sturdy, metal gutter clip inside your gutter, and affix the chain to the included hanger for simple installation. This item gently guides rainwater to the ground, or can direct it to a rain basin (not included) for fantastic water conservation. The copper construction will turn a lovely verdigris hue over time, and the familiar shape meshes with your home. Blend manmade shapes with the elements on your house with this Small Single Link Rain Chain. Some assembly required.